Part One's contributors were Tricia Hyun, Sarah Thomas, John B. King, Jr., Mandi White, and Tara Dale. You can listen to a 10-minute conversation I had with Tricia and Sarah on my BAM! Radio Show. You can also find a list of, and links to, previous shows here. Part Two's responses come from Donna Wilson, Marcus Conyers, Rachael George, Meghan Everette, and Carolina Pérez. This final post in the series features commentaries from Steve Constantino, Tom Hoerr, Dr. Cynthia "Mama J" Johnson, and Dr. Jonas Chartock. I've also included comments from readers. Research in the field of family engagement reveals that a child's happiness around school and learning is a significant factor in the family's perception of the quality of a school. The key to creating a positive learning experience for children is engagement. In general, engaged students are happier and more excited about school than are disengaged students. Current federal education reforms are providing a catalyst for states to shift instruction from a teacher-centric to a learner-centric model. This shift reflects the understanding that engagement is tied to academic achievement, which necessarily includes families. Nothing makes me happier! So what happens when students are immersed in project-based learning, like capstone projects that include public presentation? What happens when classrooms do not look like classrooms anymore? The answer: Students and their families become engaged with learning. They experience instruction with clear practical application that is relevant to their lives. And when learning is relevant to students, it's relevant to their families. Families witness their children not only learning, but explaining, demonstrating and performing their work, and placing their efforts into an appropriate academic context. Education reform that prioritizes learner-centric models are meaningful to families because they understand them. Most families understand the value of working with others, problem-solving and the application of this knowledge to college or the workplace. The focus on test-driven outcomes has left little room for skills that students will need in the workforce; skills that their families know they need and fear they do not have. These skills—that in the past have been referred to as "soft skills"—are not really soft skills at all, and students know it (so do employers). Communication, creativity, collaboration, critical thinking and civic responsibility are among many skills that are now embedded in student learning outcomes in schools. I visited a school district recently that boasted of embedded workplace simulations in all of its classrooms. I was intrigued to see how this worked. In one 2nd grade classroom, every student had a job and job description, and knew how they would be evaluated. Incredibly, these 2nd-graders were as smart and efficient as most corporate offices I have seen. I stopped one young man and asked what his job was. "Human Resources, what does that mean?" "What happens if someone is not here and the job is not done?" "Well," said the 2nd-grade human resources director, "it's my job to make sure it GETS done. I either assign it to someone else, or I do it myself. I have to tell the teacher that the jobs are done." This young man and his colleagues were engaged with their learning, and understood workplace readiness and skills (and oh, by the way, they were off the charts on standardized testing). Their families were invited to participate, and were engaged with all aspects of the classroom. Engaged students. Engaged families. Engaged teachers. Real-world learning. This type of instruction engages students, and that engages families and impacts their perception of school. The value of this type of learning is clear because we know that deep family engagement has a measurable impact on academic achievement. It just doesn't get better than that. In thinking about the exciting things happening in schools, it is tempting to think about technology. It is changing where and how we learn, as well as with whom. So much information used to be lodged in libraries and accessible only in certain times and places. Our relationships were limited to those we met or, at least, those with whom we had talked. Today, thanks to technological advances, those are antiquated notions. We each can carry more information, words, and images in our pocket than are in the largest library. The pool of people with whom we can interact spans the globe, and is almost unlimited. And newer, smaller, and faster computer chips make it inevitable that there are far more technology advances around the corner. Yet this isn't the most exciting thing happening in education. The most exciting and encouraging development in education is that we are beginning to understand what children need to learn in order to be successful. Please don't misunderstand: Our students do need to learn to read, write, and calculate, but that is not enough. Today, teachers and principals are recognizing that success in life is different than success in school, and that there are extremely important skills that aren't measured well on a multiple-guess test. This whole child perspective is in sharp contrast to the mania-like focus that we have placed on standardized test results, beginning in 2001 with No Child Left Behind. Students do need to learn to read, write, and calculate; make no mistake about this. But these scholastic skills should be the floor, not the ceiling. Students need to be able to manage themselves and their relationships with others. The evidence for this pragmatic approach to what educators should do, how children should be prepared, is evident all around us. Regardless of the criteria that we use, when we look at people who have succeeded—whether we choose financial gains, being a good parent, or being happy—it becomes clear that there are certain areas in which all successful people are strong. We see that successful people don't give up—they evidence grit. They understand that learning from failure is part of success. We note that they understand and care for others—they are empathetic. Their ability to see situations from others' perspectives enables them to bring disparate people together to work for solutions. They have self-control so their efforts are measured. They know themselves well enough so that they can plan to overcome obstacles and enticements. Successful people are those we can trust because they are more than honest; they take and stand a make themselves heard in showing their integrity. Finally, they appreciate the range of differences that humans possess, and they see these variations as opportunities to celebrate diversity. Historically, we have viewed the teaching of these success skills and understandings as a province of the home or religious institutions. That should still be the case—it would be great if every child came to school with these skills—but we educators also need to create opportunities and seize moments to teach these success skills to our students. We owe it to them. 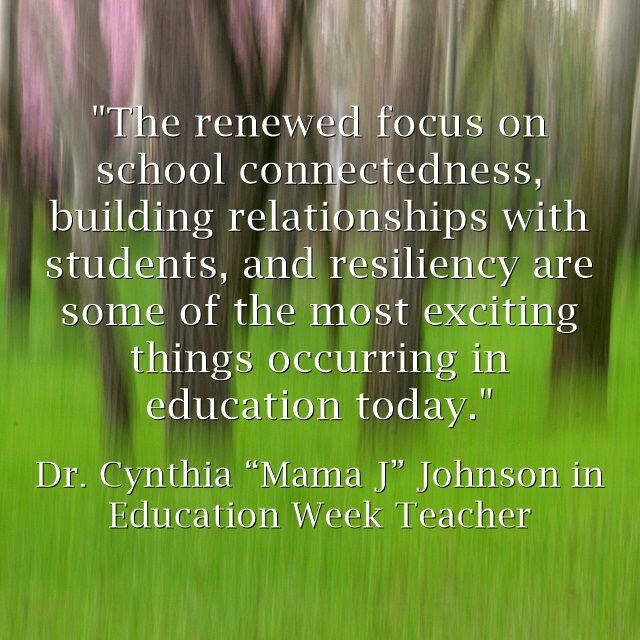 The renewed focus on school connectedness, building relationships with students, and resiliency are some of the most exciting things occurring in education today. This resurgence on what is often considered "soft skills" has expanded our understanding of today's students and has moved educators forward in meeting the needs of each student. In a day and age of accountability, rigorous standards, and high-stakes testing, the words "improve test scores" resounds throughout our nation's schools. Whether states are administering assessments in the fall, winter, or spring, the essential point is to prepare students to score high and to meet all identified standards. The demands and pressures educators face can be overwhelming and can often cause many to lose sight of the importance of connecting and building a relationship with each student. It is these relationships with students that help educators reach the goal of increasing test scores, improving achievement, and preparing each student for school, college, career, and life. 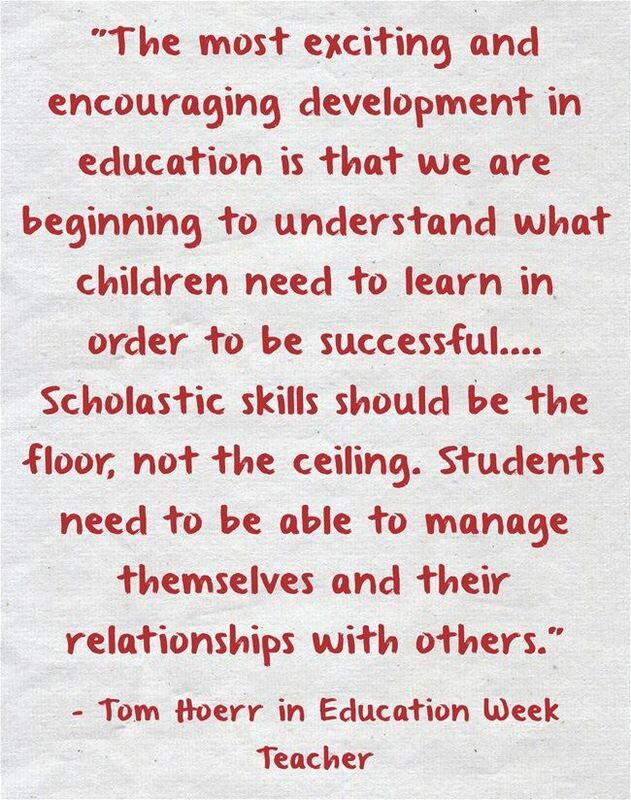 School connectedness (building relationships) is the cornerstone of education. Without this necessary foundation, a student can become disconnected and disengaged from school. School connectedness includes a broad range of concepts such as bonding, engagement, teacher support, school climate, and equity that help students attach to the school and the people in the school environment. For example, when students feel connected with adults and with the school, they experience a sense of belongingness. This feeling of belongingness is at the center of Maslow's Hierarchy of Needs and the foundation to achieving success with today's educational initiatives. Schools can be a positive or a negative force in the life of a child. One determining factor when deciding placement on the continuum between connectedness and disconnectedness is whether a student develops a meaningful relationship with an adult. By focusing on the topics of school connectedness, building relationships with students, and resiliency schools can strengthen aspects of school improvement by incorporating one of the most underrated fundamentals of modern-day school reform. 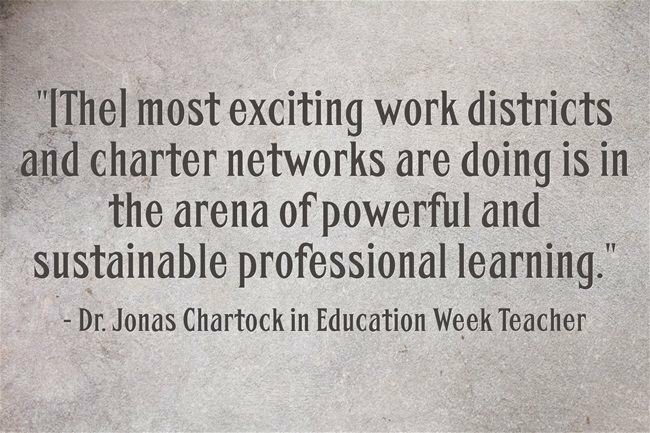 Leading Educators' partnerships around the country have convinced us that most exciting work districts and charter networks are doing is in the arena of powerful and sustainable professional learning. In April, Education Resource Strategies (ERS) profiled four school systems that are building skills and capacity in their school buildings through connected professional learning for teachers. Our own journey as an organization has led us from a model that focused solely on the development of high-level leadership skills to our current focus on developing teacher leaders in content-specific school teams. We've seen the dramatic impact of teachers within a specific content area collaborating to examine student data and then respond to it in their planning, practice, and in their own learning. LEAP is content-specific: LEAP is about building deep knowledge of content pedagogy and helping teachers apply it in their classrooms. LEAP is school-based: LEAP can be tailored to the individual needs of the school, its teachers, and its students. LEAP is an adult-learning curriculum: LEAP provides leaders with resources they can adopt and adapt to meet the needs of their teachers. We have been a strategic partner in this work, and the learnings from DC Public Schools' system-wide approach to professional development have informed our approach in other parts of the country. As part of the LEAP model, teachers at 115 DC Public Schools campuses engage in a weekly cycle of professional development in small content-specific teams at their school facilitated by assistant principals, instructional coaches, and teacher leaders. These inquiry cycles start with examining student data and work samples to identify high-priority needs. Then, content-specific teams set high-leverage, standards-aligned goals for both student learning and instruction. Teams then learn and apply instructional strategies to help students meet the identified goals. The process concludes and restarts with monitoring and replanning. The results from the first year of LEAP implementation are promising. Eighty-four percent of teacher leaders and principals saw improvements in their students' learning, and 82 percent saw improvements in their students' engagement. There are also some exciting adjustments in store for LEAP this year as the programs continues to evolve to become even more responsive to students' learning needs. This work is only sustainable when structures and systems support teachers in leading their colleagues which requires administrators and teacher leaders to grow their skills in leading cycles of professional learning. We're excited to see the results that year two of LEAP will bring, and we are experiencing a great demand from districts around the country to learn from DC's experience. Thanks to Steve, Tom, Cynthia, and Jonas, and to readers, for their contributions!